CHRIST IS RISEN! HE IS RISEN IN DEED! We congratulate you on the upcoming bright Holiday of Life, on the Holiday of the Victory of Christ over death and the open doors to the Kingdom of Heaven! and, lo, I am with you always, even unto the end of the world. Amen. 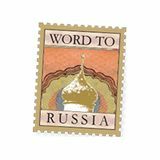 Matthew 28:19-20 This April marks the 47th anniversary of Word to Russia. Praise God for the path that has been traveled, which, by His grace continues to this day. From the very beginning, the Mission directed its ministry to proclaim the Good News to Slavic people. Russia, Belarus, Ukraine, Central Asia and other places of the Former Soviet Union, hear the words of Truth and Salvation today through our direct ministry and through the Mission’s affiliates. there with a huge charge of cheerfulness and joy from these unforgettable days spent together. In our next quarterly letter, we will acquaint you with the program of this Camp. For this event “Special Family Day” on May 4th we do not have the necessary funds for organizing: 1.Video operator, 2.Flyers, 3.Rent, 4.Banners, 5.Music, 6.Decorations, 7.Gifts, 8.Treats, 9.Transport, 10.Advertising. More than 100 children are expected to attend this year. For this purpose, it is necessary to collect about $ 8,000. We ask you to take part in the support and organization of this Special Family Event. If you live in Sacramento area and you know such families among Russian-speaking or American families, invite them to this event at The Teen Center 1514 Merkley Ave, West Sacramento CA 95691. We also invite volunteers to take part in organizing and conducting this Event. For detailed information and to register, call Victoria at (916) 400-1188.
or many years, every week, a representative of our Mission visits the Golden Days Center for the Elderly and conducts ministry with them. The service begins with singing with a group from the Center, then there is an overview of world Christian news, which we mean as topics for their prayers and in conclusion a sermon. These visits enwhole series of sermons by famous preachers of the Gospel, which are stored in our Mission. now have their new home in blessed America. More than 100 thousand Russian speakers live today in Sacramento, Placer and Yolo County. Over 80 new churches have been opened. In these circumstances, Word to Russia without leaving a ministry in the former Soviet Union, turned its attention to the people around us in California and in other states. It happened by your prayers, your help and your faithfulness in our ministry. REACHING OUT LOCALLY alifornia is a place where the cultures of many nations are mixed, and this gives us unique opportunities to learn about each other's historical and cultural value, share them with our family in our new homeland, and tell them about the Good News. 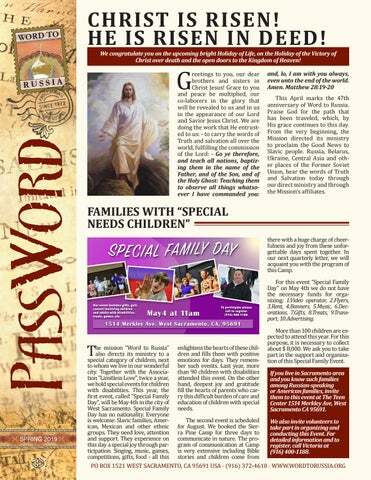 Today we want to tell you in more detail about our ministry at the place where the Lord settled us. P.A. Semeryuk, A.T. Penkov, Y.D. Diordienko and many others. Our radio is also used by some Public Entities, such as Yolo County, Children’s Center, Chamber of Commerce, SMUD, Epic School, etc. Thanks to cooperation with state and public organizations, our mission becomes a link for the Slavic peoples in our region, helping them to more actively adapt and participate in life in America. al material in the Bible. All this convinces us of the importance of the proper upbringing of children, so our Mission has paid particular attention to children's ministry for several decades. In the Mission, hundreds of original children's programs, music, songs, have been created and applied around the world. This work continues today and we remember the servants of God who contributed; Galina Bondar, Galina Mihailichenko, Valentina Visina, Valentina Taryanik and others. We ask you, along with your prayers for the churches and the needs of those places where you come from, to pray also about the structure of our ministry with you in our American home. For one Lord, one faith, and one baptism. From one blood, God produced the entire human race, for dwelling all over the face of the earth, and He desires that no one perish, but all have eternal life.